Thoughts about games: easy is fun? So far, my blogging has been solely about my work as a filmmaker for the Wellcome Trust. However, I have another aspect to my role there, as a sort of web producer, which lately has been focussed on creating games. Lots more on that to come later. Particularly as I gather my thoughts following our successful launch of High Tea, a game with broadly educational aims which puts the gamer in the position of an 19th century opium smuggler in the Pearl Delta. One aspect of the experience has really got me thinking over the last week or so and I’d love to hear what other people think about. Though it varied between sites, such negative comments as there were about High Tea largely revolved around the difficulty level, especially on Armor Games. Many gamers appreciated that it was hard to beat, and this may have added to the addictive quality and replay value. However, others wanted us to change some of the functionality in a way that would have made it incredibly easy. It seemed that a simple clickable walkthrough was genuinely what some players wanted, though of course it’s impossible to know whether they’d really have enjoyed it if that was what we’d given them. In the same week, two other huge games were launched to huge ratings approval: Icy Gifts and Sushi Cat 2. 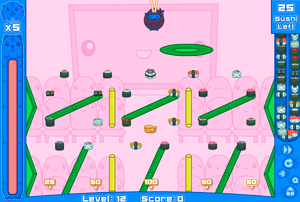 Both are cute, and Sushi Cat in particular has really charming graphics and a neat, if very simple, little narrative. But both rely on game mechanics that require almost no skill whatsoever and are pretty hard to lose. The difficulty, if any, is about factors that are beyond the player’s control, so beating it requires merely a bit of luck. I must admit, I played through both. Icy Gifts has an achievements system that lead to me going back and playing through all the levels again until I’d racked up all possible achievements. But I’m not sure I even enjoyed it, I was just a rat pushing an especially pretty little lever for my reward. Why do people (including me) play these games? Is it the window dressing of graphics and SFX that makes the difference? Is it the illusion of skill? I’m sure others must have already done some thinking around this, so would love to hear if there has been any research/conclusions in this area. What you ask is a huge area of enquiry, absolutely – and I suspect you’ll find there’s no general answer beyond ‘You can please some of the people some of the time, …’. Certainly, I play different sorts of games at different times, in different moods. Sometimes a quick challenge/reward cycle holds my attention, sometimes I’d rather have a deeper engagement and a more complex experience. One issue, I think, surrounds setting expectation. The sometimes-subtle storytelling approaches of, say, Bioware RPGs deliver an entirely different experience to anything you’d expect to find at Armor Games. That can only be complicated if you have an ulterior-motive message you want the game to convey.